The detection of ice crystals is based on the measurement of the volume depolarization ratio. Backscattering (single scattering at exactly 180°) by spheres (liquid drops) does not produce any depolarization as shown in Fig. 1. Backscattering by nonspherical crystals introduces considerable depolarization (via the process of many internal reflections). 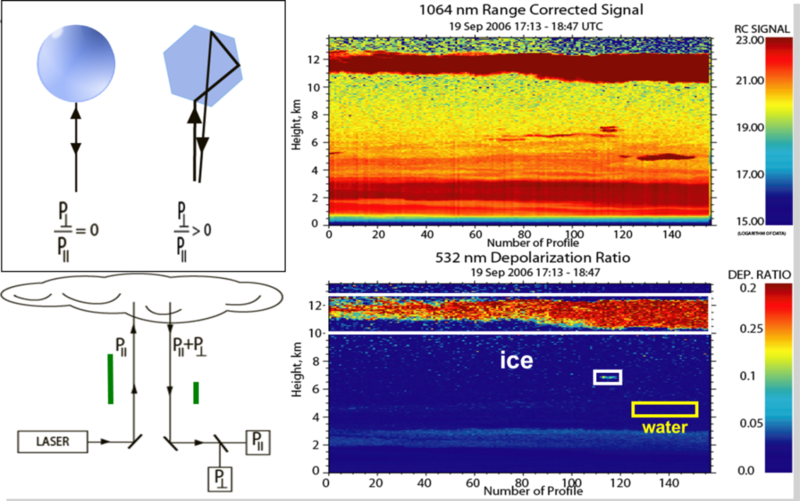 Thus, the volume depolarization ratio allows us to discriminate cloud layers consisting of water drops and cloud layers in which backscattering by ice crystals dominate [Sassen, 2005; Ansmann et al., 2009].